Each year, during the second week of June, Little League® International celebrates National Little League Week with the annual Little League Baseball® World Series Luncheon. This year’s luncheon, held on June 14, featured members of the Hazleton Little League Challenger Division, as well as New York Mets Hall of Famer, Mookie Wilson, and former major leaguer and Philadelphia Phillies broadcaster, Gary “Sarge” Matthews, who assisted with the first-round pairings for the 2018 Little League Baseball World Series (LLBWS). 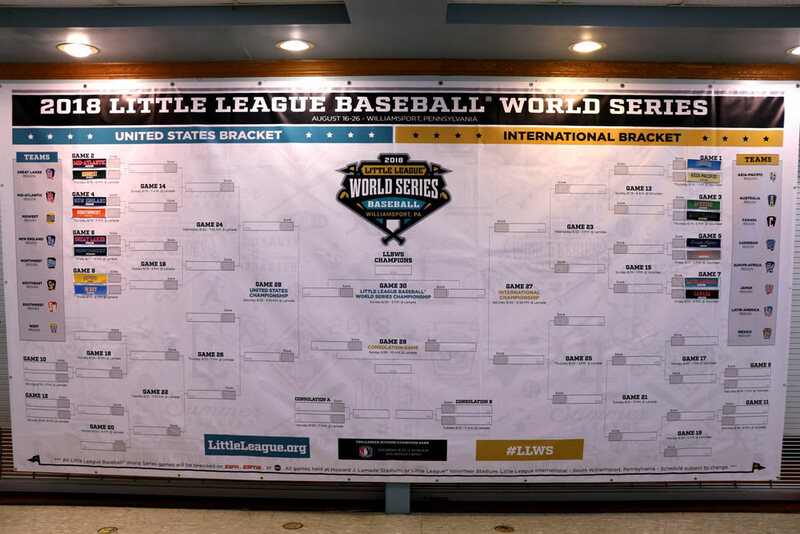 The full schedule, bracket, and all information about the 2018 Little League Baseball World Series, as well as the entire Little League Regional and World Series games, can be found on LittleLeague.org. Mr. Wilson and Mr. Matthews participated in the event’s festivities to celebrate the MLB Little League Classic, which will take place on Sunday, August 19. Major Leaguers on the Philadelphia Phillies and New York Mets will open the day at the Little League International Complex where they will interact with members from each of the 16 LLBWS teams and attend some of the day’s games before going across town to Historic Bowman Field to participate in the MLB Little League Classic, airing nationally that evening on ESPN’s “Sunday Night Baseball” and ESPN Radio at 7:00 p.m. (ET). This year’s LLBWS will once again feature the Little League Baseball World Series Challenger Exhibition Game, as teams from Hazleton (Pa.) Little League and Highland Baseball Club (Evansville, Ind.) Little League will take the field. At the luncheon, David Drauschak and Lexi Mamourian, members of the Hazleton LL team, along with their League President, Ed Shoepe, and District Administrator, Jim Burns, assisted Mr. Wilson and Mr. Matthews with the first-round drawings. The 2018 Exhibition Game will take place on Saturday, Aug. 25 at 10:30 a.m. at Volunteer Stadium, and air live on Northeastern Pennsylvania’s and the Central Susquehanna Valley’s PBS Station, WVIA. The 2018 LLBWS Luncheon also included the Team Hosts drawing for their Regional Champions for the year. With the Little League World Series Luncheon concluded, the Road to Williamsport is officially underway as eight teams from around the world and eight teams from the United States compete for a chance to represent their region over the next eight weeks. The first of those 16 spots was officially filled earlier in the week as Gold Coast Little League became the first team from Queensland to win the Little League Baseball Australia Region Championship and earn the trip to Williamsport. To learn more about the Region Tournament dates and locations, visit LittleLeague.org. All 32 games of the 72nd Little League Baseball World Series will be televised by the ESPN Family of Networks or ABC – starting with the first game between the Caribbean Region and Asia-Pacific Region on Thursday, August 16 at 1 p.m. on ESPN, and concluding with the Little League Baseball World Series Championship Game on Sunday, August 26 at 3 p.m. on ABC. In addition to the 32 Little League Baseball World Series games, Little League Baseball and Softball will see vastly expanded coverage with more than 200 Little League games televised across the ESPN Family of Networks. Along with televised coverage of each of the six Divisional World Series Championships and expanded coverage of the Little League Intermediate (50/70) Division World Series, this year also marks the first time that Little League Softball World Series, as well as all U.S. Regional Tournaments at the Little League Softball division, will be covered in their entirety, with coverage on the new streaming platform, ESPN+. For the second-straight year, the Little League Baseball Canada Region Tournament will once again see coverage of round-robin games, both semifinal games, and the championship final, courtesy of CBC Sports. All coverage is subject to change. WRAK (1200 AM/1400 AM/94.9 FM) in Williamsport will broadcast all games of the 2018 Little League Baseball World Series. WRAK is the flagship station for the English-speaking radio broadcasts of the World Series. The station has broadcast the World Series every year since its inception in 1947. For all updates on the Little League World Series tournaments and events, go to LittleLeague.org, follow @LittleLeague on Facebook, Twitter, and Instagram, and join in on the conversation by using #LLWS.